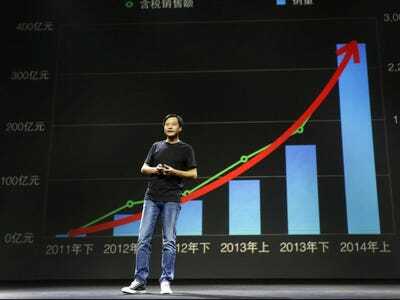 REUTERS/Jason LeeXiaomi CEO Lei Jun shows the company’s smartphone sales growth. A table in the document showed that Xiaomi’s net profit last year rose 84% to 3.46 billion yuan ($US566 million) from 1.9 billion yuan in 2012, while its revenue more than doubled to 27 billion yuan. Another table included a forecast of a 75% net profit increase this year. If these numbers are accurate, and Xiaomi really is earning a profit, it’s impressive. Many other smartphone companies are losing money — Blackberry, Sony, HTC, etc. Xiaomi is the fourth biggest smartphone seller in the world thanks to its strong brand in China, and its low prices. It sells Android-based phones that are as good as Samsung’s Android-based phones, but cost half the price. Smartphone sales account for 94% of Xiaomi’s revenue. The rest comes from other products like software and services. Most people assume that Xiaomi is losing money on every phone it sells since its prices are so low. Xiaomi can earn a profit because it spends very little on marketing. Most of its sales come from word of mouth buzz. This is tiny compared to Apple, which did $US37.5 billion in profits last year. But that doesn’t matter. Not every company has to earn insane amounts of money. Plus, Xiaomi is only in its fourth year of existence. Xiaomi is looking to raise money at a $US40-$US50 billion valuation which would make it the second most valuable Android phone company after Samsung.